Let's face it, with the type of climate in San Diego, almost any place outdoors is a good place to have a picnic, maybe even starting with your own backyard or simply heading to the neighborhood park. However, if you're in the mood to venture a bit further, San Diego has many choices for a good picnic setting. Picking one depends on what type of seeing you're in the mood for... Proximity to a playground? The beach? Balboa Park? Here are some of the best spots in San Diego to have a picnic. If any outdoor spot epitomizes the good life in San Diego, Ellen Browning Scripps Park may very well be it. Located in La Jolla overlooking picturesque La Jolla Cove, this patch of grass features the surf and sand below, ocean breezes above, and scenic beauty all around. 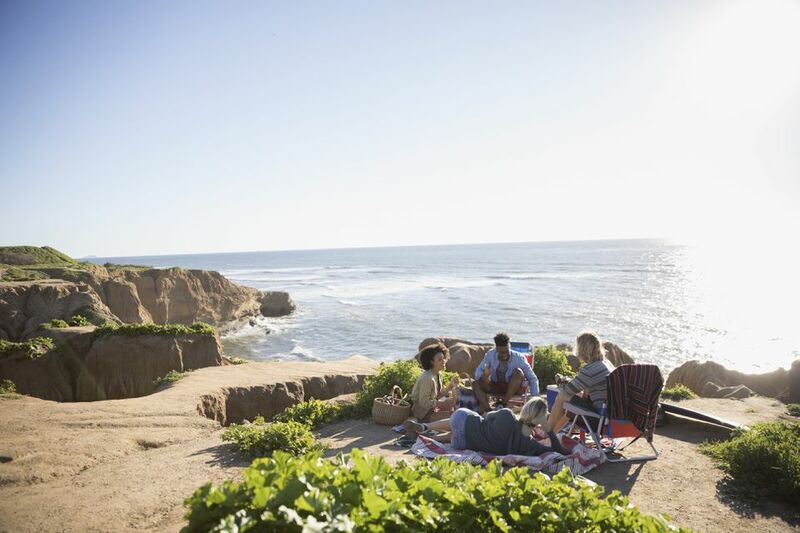 A picnic at Ellen Browning Scripps Park is ideal for just setting out a blanket and soak in the scenery. You'll find it's usually crowded, especially on weekends, so it may not be a place for solitude, but it's a great place to relax and people watch. Pretty much any spot in Balboa Park is a great place for a picnic, but if you have kids, Pepper Grove is the picnic area you'll want to be. Located just south of the Prado area along Park Boulevard, Pepper Grove is a great picnic spot for family events such as birthday parties since it has over a dozen picnic tables. Making even better for kids is a large, well-equipped playground area. And, if you feel like taking a stroll, Balboa Park's wonderful museums and sights are a short walk away. Kate Sessions Park gives you one of the best panoramic views of the city to go with your picnic. Located at 5115 Soledad Road in Pacific Beach just as the road starts heading up to Mount Soledad, Kate Sessions Park is an idyllic slice of green above the hustle and partying of PB. Holiday weekends can sometimes have a different ambiance, though, since the park can get more crowded and boisterous with revelers. Those times aside, the park is a wonderful place to have a barbecue, throw the frisbee, bring the dogs and enjoy the amazing views of Mission Bay and beyond. Presidio Park, above Old Town, has some wonderful hilly, grassy areas where you can throw down a blanket and enjoy the solitude. But there's one particularly great little area that's perfect for picnics located at the top of the winding road leading into the park. Called the Arbor, it's a little triangle slice of grass just before you head into the immaculate Mission Hills neighborhood. A few picnic tables are about the only amenities, but it's such a peaceful area that you can't help but feel stress-free after having a picnic there. Rohr Park is one of those large, recreational parks with all the requisite amenities: Picnic areas, walking trails, playgrounds, and softball fields. Oh yeah, and a miniature railroad. Located in Bonita, adjacent to the Chula Vista Golf Course, Rohr Park is a popular picnic site for these reasons. If you're having a large gathering, or need a facility that has lots of recreational space, Rohr Park is a great choice. Unless you live in the surrounding neighborhoods around Oak Park, you probably don't know about Chollas Lake Park. This idyllic spot in the middle of the city's urban core is a great place for a family picnic. The 16-acre lake, surrounded by groves of eucalyptus trees, is especially great for kids: the fishing is free and only for kids under 15, plus there are playground areas, a basketball court, hiking trails, and a .8-mile walking path around the lake. Picnic tables and barbecues are scattered all around the lake, making it a perfect spot for an all-day picnic. The largest San Diego Bay park, Tidelands Park, offers a small beach, recreational fields, picnic areas and plenty of open space for a variety of outdoor activities. A scenic bike path extends from the Silver Strand to the Old Ferry Landing. Located just at the foot of the Coronado Bay Bridge, the park offers a large grassy area for picnics and games, and there's even a small beach for a dip into San Diego Bay. The entire Mission Bay Park is ideal for picnics, but if you're looking for an out-of-the-way spot in the midst of all the recreation going on, the area around the Model Yacht Pond is your place. Located on Vacation Isle near the Paradise Point Resort, this usually quiet spot is nice for just chilling, reading a book, and enjoying the sun. An added bonus is the model yacht pond, where hobbyists race their sail and motor powered model boats. With lots of grass, trees, picnic tables, and beach access, it's a nice picnic spot. If you're looking for a spot more with a backcountry vibe, El Monte County Park is a popular spot. El Monte Park is one of the original County parks. The spectacular rocky face of El Cajon Mountain rises high over this 88-acre park, dominating the other mountains that encircle this valley. There are plenty of recreational opportunities, including a ball field and play areas. Seven reservable picnic areas make every size picnic easy to arrange. If you're looking for a nice, neighborhood park, then Pioneer Park is where you want to have your picnic. Also known as Mission Hills Park, this clean grassy spot goes back to the 1800s and is known for a unique characteristic: It is the location of one of the first cemeteries in San Diego, hence the "pioneers." A playground area also makes it great for families.